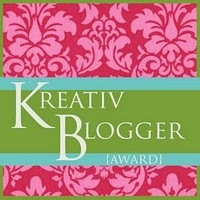 Tonight I have been awarded not one but TWO Kreative blogger awards by two of my lovely readers. I am absolutely over the moon with this. It is SO nice to know people enjoy reading my blog. Thankyou very much to Blog of Shadows and Keep Moving Forward. You should all go and check out their lovely blogs. This is actually my first award so bare with me. I am just going to copy, paste and hope for the best. 2. Complete the form below/answer the questions. 3. Award ten other bloggers, and let them know. 4. 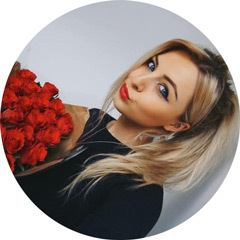 Share seven random thoughts about yourself. I have too many. Probably one of Beyonce's classics. (I love her!) At the moment though it's Avicii - Levels. Ignorant, rude people. There's nothing worse. Cry. I'm very emotional and cry at the drop of a hat. I've only ever had fish. how boring. I absolutely love my nanna and grandad's dog Amber though. Take everyday as it comes. Life is full of surprises. There is no such thing. Unless your Beyonce. Then your pretty damn close. Pizza! You can't beat a nice greasy pizza with tonnes of toppings. Perfect hangover cure. I love so many blogs. These are some I enjoy reading but I could of awarded SO many more. 1. I used to suffer really badly with OCD. It has got better but I still have my weird and wonderful ways. 2. I love cooking. I'm a secret cookery geek and love a bit of Masterchef and Saturday Kitchen. 3. I have been to Australia 4 times and will be going for my fifth time this year. 4. I LOVE Avocados. Guacamole .. Mmmmm. 5. I am obsessed with Disney films. Tangled is my current fave. I watched it every day for a week. (Sometimes more than once. I am officially SAD). 6. I am also obsessed with Beyonce. I have been to see her twice. Two of the best nights of my life. She is a goddess. 7. I am very strong-willed and opinionated. It's all about standing up for what you believe in. Thankyou again to those who awarded me! I would award you back but I don't think that's how this works? I'm clueless!